The MakerBot Replicator Mini Compact 3-D Printer is housed in a rigid frame which is open at the front, on the sides, and on top permitting easy access to the printer bed and easy viewing of prints in progress. Printing can be initiated from a computer over a USB or Wi-Fi connection, as well as over Wi-Fi from an iOS or Android phone or tabloid with a MakerBot Mobile app installed. A camera in an upper corner of the Mini allows monitoring of print jobs from a computer or mobile device. The Mini's build area is 3.9 x 3.9 x 4.9 inches. Small (0.5 lb.) 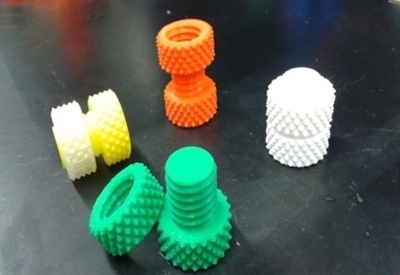 spools of 1.75 mm polylactic acid (PLA) filament are required and are available at the lab in several colors.